Bake and create a garden party for the LEGO Friends! The sun is shining and Stephanie is putting the finishing touches on her garden party. Take the fresh-baked cakes out of the oven! Help Stephanie to wash dishes in the sink and set the umbrella garden table! The LEGO Friends are on their way for a girly day in the sunshine. Includes Stephanie mini-doll figure…. 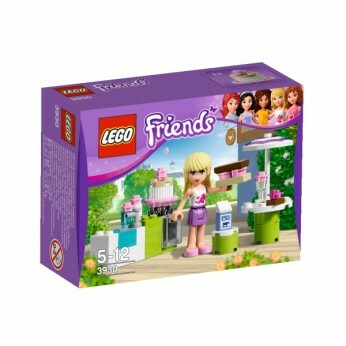 This toy costs approximately £4.99 (for the latest and best prices make sure you check our retailer list for the LEGO Friends Stephanies Outdoor Bakery 3930 above). In our review of LEGO Friends Stephanies Outdoor Bakery 3930 we classed it as being suitable for ages 5 years, 6 years, 7 years, 8 years but recommend you check the manufacturer specific advice before purchasing.